I'm very curious about the second album cover. It seems as if the cover design, as we know it, was set. Then, when Michelle was fired, Jill literally came into the picture. The booklet in the Creeque Alley CDs shows the image of Jill stripped into the original photo. 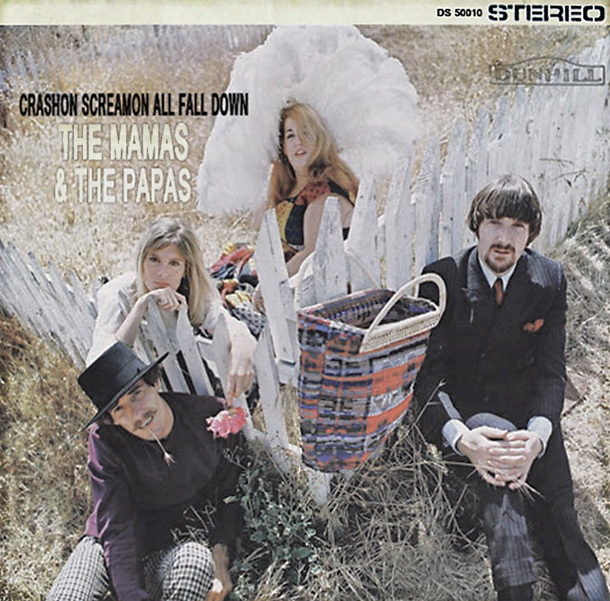 Yet, when the album was advertised before it was released, it had entirely different title and cover: CrashOn, ScreamOn, All Fall Down, with a great cover featuring the group, including Jill, in an outdoor picnic setting. So at what point was the alternate cover considered? If Jill remained in the band, which album cover would have emerged? And why did they abandon the original title for such the unimaginary self title? good point and I remember the tv guide advertising 'the Papas and the Mamas' under the title 'Springboard' with an entirely differet cover. John Sands wrote: good point and I remember the tv guide advertising 'the Papas and the Mamas' under the title 'Springboard' with an entirely differet cover. Wow. That is really interesting, and I don't think it's ever been mentioned or referenced anywhere. Has an image of this ever circulated anywhere? I wonder how much control, if any, the group had with regard to album titles/graphics. During that time, I believe the studio heads made most of the decisions. Springboard is a much more interesting title. By the way it only took me 5 months to respond! I was briefly Straight Shooter (more like Late Shooter). there was a picture of it in the TV Guide for one of those record clubs and it had one of those outside pics with Michelle in yelow shawl on the coverr. I brought this up before and Richard mentioned something about it but I don't rememember what. Maybe he can mention it again? RBC, where r u??? thanks, Now can we gat a scan of 'Springboard' with Mama Michelle? Many thanks for effort put into this. It's the most clearest image of a great record cover that never exsisted! Anyone have a scan of 'Springboard' with mama Michelle?